When you enter the premises, you will be warmly welcomed by our dogs. The two Appenzell Mountain dogs, Sahbi and Senna, stay with Marc and Mariska. Sahbi is a free dog who likes to go her own way, but Senna always stays close to Mariska. She has lived eight years on another farm and is a former puppy of Noxy. Noxy has always lived with Marc and Mariska and January 4, 2011 she was quietly put asleep at the age of almost 13 years. Puk is the small dog of Jos and Maria and usually lives in Dronten. Every now and then she comes on the farm. Musta, Joris and Natasja’s dog, is a hybrid labrador/german shepherd. She entertains herself with all kinds of dog toys, but also with branches of trees or a potato that rolled from a truck. The youngest inhabitant at De Kandelaar is Tahra (dog). Tahra was born on 7th February 2015 and was not planned! 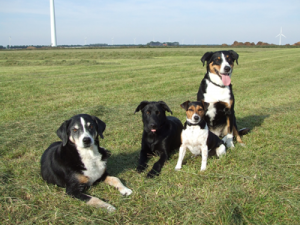 Her mother, a Swiss Mountain Dog was visited by neighbouring dog‚ Rover‘ an Appenzeller Mountain dog. Unfortunately, Tahra’s mother died in a car accident when her puppies were only 7 weeks. Now, this “second” Tahra’s task is to greet guests cheerfully. 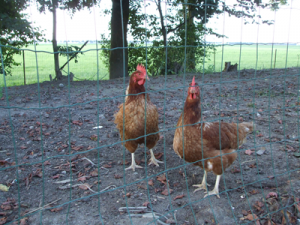 These are our Barnevelder chickens. They provide a fresh egg every morning. They also clean up the soil under the bushes all day. Of course, there are cats with us on the farm. They ensure that we don’t have any inconvenience of mice. In winter, the cats can often be found in the stable and barn and once the harvest begins, they go hunting for mice. Each year we look forward to some nice young kittens from them. 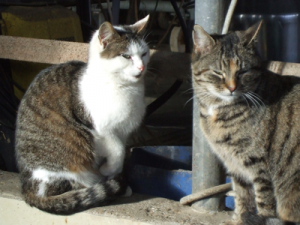 Please contact us if you are looking for a nice cat on the farm. Here you can see the sheep. At the moment we have one ewe of the Texel breed and one Drenthe heath sheep. Every spring lambs are born. For us this is the real start of the spring. 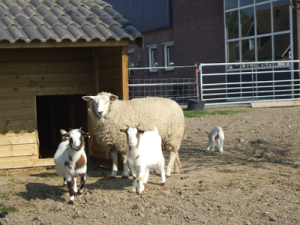 Since Mariska always had goats, the pygmy goats shouldn’t be lacking on De Kandelaar. Also with the goats we expect young goats every winter, to play and jump around on the tubes in the meadow.